Okay, who’s ready for a little poetry? Did I say ‘a little’? I meant plenty of good poetry to go around. 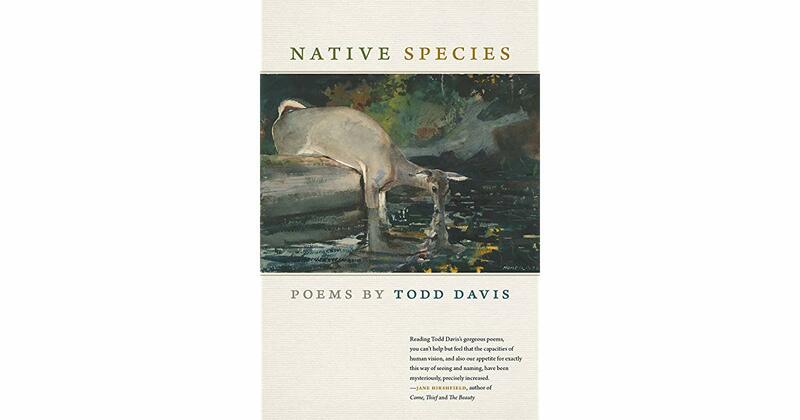 To begin, in search of the divine in the daily, the selections in “Native Species” from Todd Davis, professor of environmental studies and creative writing at Penn State University get to the heart of what matters. Davis’s lines tend toward this divide, the observable world just next to the imagined or the wondered about, his relics marooned in mud as well as in the flood of unstoppable time. These final syllables carry centuries painful echo. Smith’s verse indeed shoulders heavy emotional weight, though she, thankfully, avoids didactic tendencies. In “Nearing November” the narrator observes “an old radio, a table covered with/ maps” as the “lamp tilts away/ from the window,” the moment leading him to “think star, the infinite/ riff of atom, the endless solo of form.” Ridl’s poems riff from simple as well as suggestive. Close to home, deep in the north woods, or threaded historical fabric, the poems in these collections remind readers of how a little poetry can provoke, salve, or calm as needed.